Recently, I’ve been hiking solo whenever I get a chance. This might not seem big for some people, but for me, it’s a HUGE deal. I didn’t grow up hiking, so it’s something completely new, and completely scary. I have so many fears surrounding hiking in general, and doing it solo only amplifies these fears. I’ve been avoiding hiking activities for years because I haven’t found that forest-smart wild-person-who-can-fight-off-wolves to go with me. But no more! I’ve been hiking solo and loving it. This was by far my #1 biggest fear of doing any hiking. I assumed that in order to hike, you need to know how to read the compass, the stars, the wind, and a complex map. I just imagined people going into the woods and magically knowing how to get out because they had special fancy skills that I could never trust myself with. I can barely read a map in a city! In the woods, all trees look the same! Can you tell where the path is? I hope so! It’s very obvious. The reality is that hikes in national parks and places like that are man-made. There is a clear trail, many times with markers and signs. 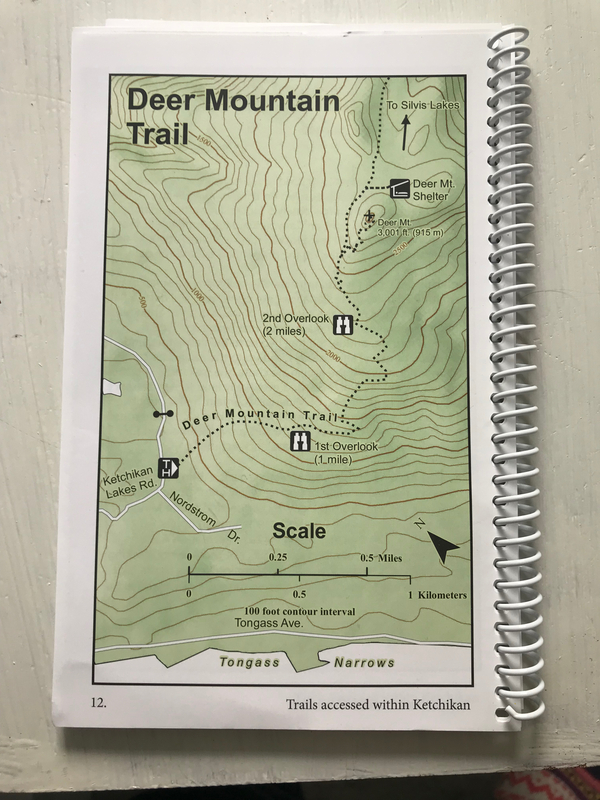 Take a look at this map from the Deer Mountain trail I completed recently. While the trail itself is pretty complex, changing elevation and curving along the way, it is just one path. Just follow the man-made “yellow brick road”, don’t go off of it and suddenly following a map is one of the simplest tasks in the world. Now, there are people who do go into the wilderness with a compass and all that stuff and figure it out, but to see beautiful nature, you really don’t have to do that. Just grab a map from the local national park service, and you’re all set to go. The scariest thing about going hiking solo is that fact that you might trip, twist your ankle, have no cell phone reception, and be helpless until night falls and you get eaten by an animal. This is a legitimate concern. However, you can trip and die anywhere, including in a city. The only certainty in life is that you’re going to die. You don’t know when or how, but you will die. It could just as simply be accidentally tripping and falling into traffic in your own home city. Safety is an illusion. Even if you stay home all your life, like a bubble boy, never going out because you’re afraid of an accident happening, you could still die in your own home from an accidental carbon monoxide leak. But even without any accident happening. If you never do anything because you’re scared, then you’re dead already. What kind of life is it just sitting at home afraid to explore because there’s a chance something bad might happen. At least if you die in the woods, you were doing something brave, living life. But outside of all that, hiking is the same as walking. If you know how to walk, put one foot in front of the other, you know how to hike. The only difference is that the ground might not be as flat, so you have to be mindful of where you walk. This is super comforting to me for some reason. When I’m climbing a big mountain, with no end in sight, I just focus all my energy on putting one foot in front of the other. Slowly, I always make it to the top. I’m just a lot more careful walking in the woods. If I want to drink water, I will stop and drink water. If I want to look at my iPhone, I will stop and look at my iPhone. If I want to take a picture, I will stop and take the picture. It’s common sense safety. Watch where you’re going. If you need to do something else. Stop and do it. Don’t walk and look at your phone. In order to overcome my fear, I talked a lot to the people in the visitors center and locals. They know what to expect and what to do. I learned that the bears don’t really want to attack humans. So I just need to stay still, remain calm, talk in a soft voice (like to a grandpa) and let the bear do it’s thing and walk away. If I run, it might activate the bear’s predator response. 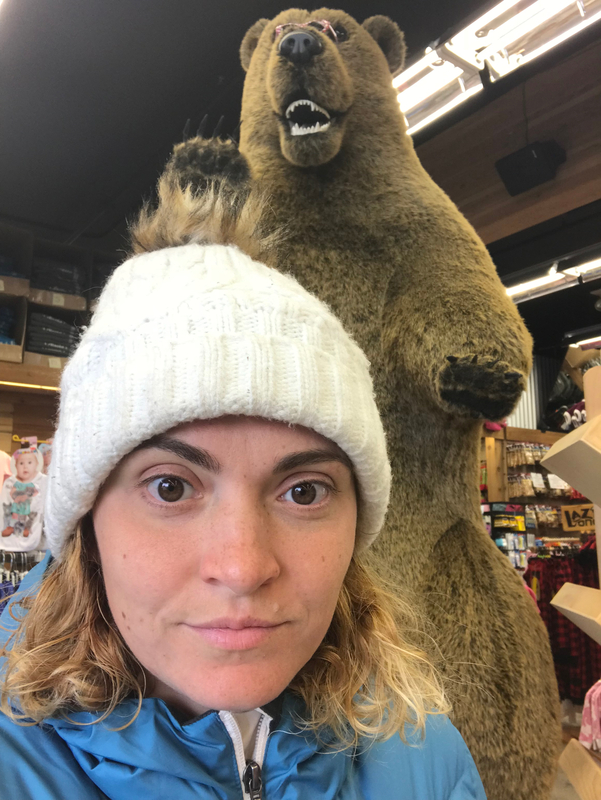 Many locals have only seen a bear in town… which is comforting. There is a bear that comes to where I live all the time - I only know because I wake up and there’s garbage in front of my AirBNB. I bought bear spray and carry it with me during the hikes as a precaution. The locals are key. I learned that in places like New Zealand, there are no scary animals. I can walk at night and not worry. In Norway, there are only reindeer that run away as you approach. I’m still not comfortable about animals in the woods. I won’t be going to the woods in India… But I learn as much as possible, and decide whether to take the risk. I won’t NOT hike because animals live in the woods. Then I will never hike. I think the definition of a hiker should include something about being able to go to the bathroom in the woods. Seriously, it’s a necessary condition for hiking. My first hiking trip was before I started college - all incoming freshmen had the option to participate in a big week-long camping trip before moving into the dorms. I signed up with no experience. They gave us t-shirts that said “Can you dig it” with a picture of a little hand shovel for digging - I didn’t even understand… I learned later that you’re supposed to dig your own toilet paper into dirt…. My disappointment only grew when I saw that the toilet was one upgrade away from a porter potty. It was disgusting. I missed going in the nice woods. Fear #5: What if there’s a serial killers in the woods? We’ve all seen that movie. Girl goes alone into the woods, girl gets murdered. I used to think that the woods were the ideal place for serial killers and rapists (thanks Hollywood!). But the people I met in the woods have been super friendly and helpful. Much nicer than in the city. 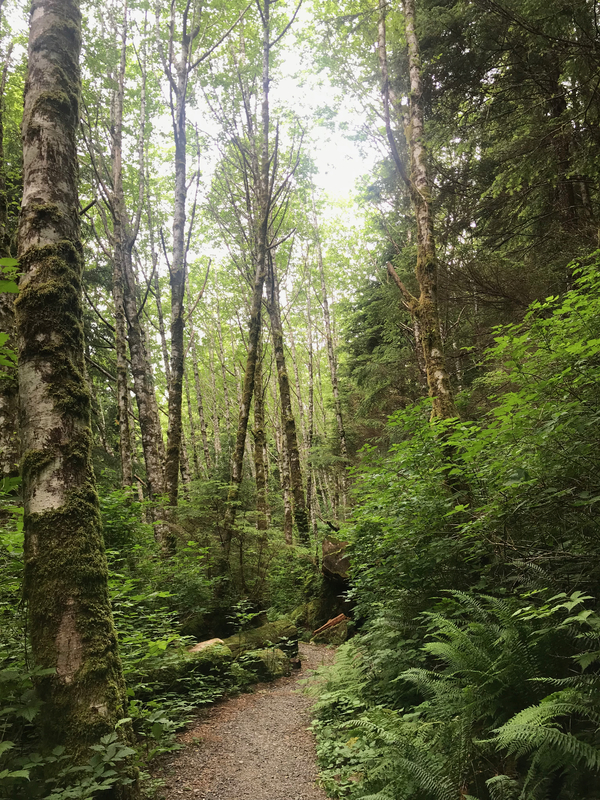 In the woods, we’re all a little scared being alone (even if you’re hiking with a friend), so when we come across another hiker, we’re so happy to see them! Something about knowing that if you do trip and fall, there might be someone out there who comes and helps you. If you think about it, the woods are actually the worst place for serial killers and rapists to hang out. Not that many people come through. And from the ones who do, not many will be single women. The best place to find targets are in the city, in dark allies, in clubs, etc. That’s why those killings in the woods happen mostly in movies. Even in movies, it’s more likely that the body was found buried in the woods - the killing happened at the victims home. The more real-life story goes like this: Girl goes alone into the woods, girl has a great time hiking and comes home. I know because I’ve been that girl many times. Not movie material, but a lot more real. While hiking alone is not the most comfortable thing to do, I love doing it. As I already said, I won’t give it up just because I’m scared. However, there are a few things you can do to make your trip a bit more safe. Bring extra water, food, and layers of clothes in case the weather changes or you do get stuck and have to wait for someone to come help you. I know that means carrying extra stuff that you’ll likely not need, making your load heavier, but it doesn’t hurt to be prepared just in case. You can also tell your friends and family where you’re going. If they don’t hear from you in a certain timeframe, they’d be able to call for help. In the same vein, make sure you have an extra battery pack for your cell phone - I carry one that will last me 4 full charges! I also saw ones that are solar powered. In Alaska, I found out from the locals that I can even get a beacon from the library - this beacon includes GPS tracking of my location and an SOS button to call for help even without cell reception. If I’m not back during my specified time, a volunteer will come find me. Check with your local forest service whether they give out a similar device. I haven’t done this one yet, but I’d love to get some type of wilderness survival training, including how to use a first-aid kid. Do whatever you need to make yourself feel “safer” to hike. But don’t let the remaining fear stop you in the end. Hiking in the woods solo is not the safest thing to do, but living is deadly no matter what you do or don’t do. My mom literally re-iterated every fear I had about hiking solo. And here I thought these were my personal fears. Instead, I was afraid because someone told me that this wonderful experience is scary. Where do your fears come from? Are they legitimate? What are practical things you can do to address them?